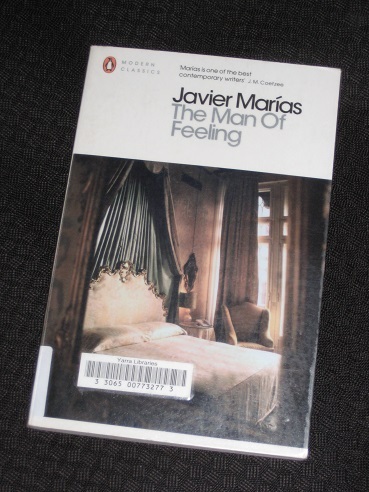 The Man of Feeling (translated by Margaret Jull Costa) is the earliest of Javier Marías’ books to come under review at my site, and while it’s a lot shorter than his later novels, clocking in at a mere 137 pages, it has all the features you’ve come to expect. The story takes the form of a series of notes the narrator, a successful opera singer, decides to take down after waking from a vivid dream based on real events that happened four years earlier. Sitting in his apartment on a short winter’s day, he summarises an eventful couple of weeks in his life, switching between the dream and real life while commenting on what he’s relating and hinting of what is to come. And since I’m no use to him whatsoever (for that’s the truth of the matter), he can manage perfectly well without my purely theoretical services; Manur can do everything without my help and I serve a far more useful purpose, a far more valuable role, keeping Natalia company and making sure she doesn’t get bored and doesn’t suffer and isn’t entirely miserable. Do you understand? Do you see? I am a companion, nothing more, and both of them, Natalia and Manur, know that is what I’m paid to do, and they make that quite clear. And I know it too. The singer understands the need for company as he’s often bored during his long stays rehearsing away from home, so he’s only too happy to spend some time with Dato and Natalia over the following weeks. However, when he (inevitably) begins to get close to Natalia, Manur is forced to intervene, in a most surprising manner. This one is a story of love, but perhaps not as you’re used to seeing it as the main characters each have their own idea as to what love is. The narrator, a seasoned world traveller with a partner he doesn’t really want, has a rather casual approach to relationships, while Natalia is a mystery he wants to get to the bottom of. Perhaps the most enigmatic of the major characters, though, is Manur, a meticulously turned-out man who remains in the wings for the majority of the story. There’s obviously a secret behind his marriage, and narrator and reader alike are intrigued, wondering whether he loves Natalia and if they’re really together. Another important theme in the novel is that of displacement, with the group initially brought together as a result of similarities in their lifestyle. Both opera singers and travelling businessmen must endure the loneliness of strange cities as a result of their duties, meaning that Dato and the narrator recognise the other’s frustrations at their first encounter. There’s also a certain irony linking Natalia with the singer. Both grew up in Madrid, but having moved away and lost contact with family ties, the two are now adrift in a familiar yet cold city, making it even more inevitable that they will come to depend on each other. As is often the case with Marías’ protagonists, the singer is a man who, despite claiming to be baring his soul, has secrets he’ll hide until the last few pages. Of course, it wouldn’t be a Marías novel without a Shakespearean reference, and The Man of Feeling doesn’t disappoint here either. The reason for the narrator’s return to Madrid is to perform in Verdi’s Otello, and it’s hard not to assign one of the four main roles to each of Marías’ creations. Manur makes for a splendid (Belgian) Othello, and Natalia is obviously Desdemona, yet the other two roles are more problematic. Yes, the singer is in town to play Cassio (and the slightly odd-looking Dato is an obvious choice for Iago), but it’s best not to be fooled into seeing them as exact parallels. Our Spanish friend has a wicked sense of humour, and this might well turn into a twisted version of the Shakespearean tale.